Finance Costs > How Much Does Kroger Charge to Cash Checks? How Much Does Kroger Charge to Cash Checks? Is Kroger able to cash a check, you may be wondering? Well. The answer to your question is: it depends. How much does it cost to cash a check at Kroger? Check cashing fees, according to Kroger, start at $3 if you have a shopper’s card for checks up to $2,000. If the check amount is $2,000.01 to $5,000, then they charge $5.50. This fee, however, can vary by state, so it’s always best to call your local location for exact pricing. The fee mentioned above covers the cashing of a single check, and the limit is $5,000 for most situations. According to this USA Today article, for example, Kroger will charge $3 to cash a tax refund check, and if the check is over $2,000, they will charge $5. This Topix.com forum thread states that most Krogers in the area charges $5 to cash a payroll check. If you were to purchase a reloadable debit card to deposit the check that you cashed at Kroger, you might have to pay deposit fees. You also might have to pay maintenance fees if you choose to put that money on a debit card. Bank Account. Instead of having to hassle with cashing checks at Kroger, try to open your own bank account. This is usually free to do as long as you keep a minimum amount in the account. You can cash any type of check-in any amount when you have a bank account. Issuing Bank. If you were written a personal check and cannot find a service that will cash it for you, you can go to the issuing bank and get it cashed. Look at the check for the bank information. Since the bank can check the check writer’s account and verify his signature, they can make sure that it is a valid check and that there are enough funds to cover the written amount. Most Kroger stores will cash payroll checks, tax refund checks, insurance settlement checks, business checks or government checks. Call before you go to the store to ensure they will cash the type of check that you have to save yourself time. Most of the time, you will find locations won’t cash personal checks, starter checks or casher’s checks. Kroger is not available in every state of the United States; therefore, not everyone can take advantage of the cash checking services. However, Kroger does exist in other states working under different names. For example, in Arizona, Kroger is known as Fry’s. 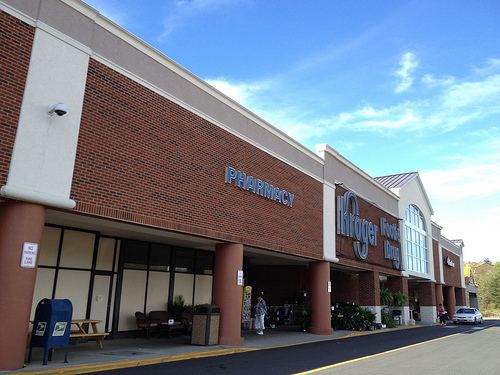 Call up your local Kroger ahead of time to know exactly what your local store will charge. Be sure to bring a valid I.D. and know your social security number to properly cash your check. Without out, they won’t be able to cash your check. Valid identification forms include a driver’s license, military ID, state-issued ID, resident alien ID or US-issued passport. Sign up for a Kroger Plus card if you don’t already have one in order to save on the fees. If you need your money right now, it’s far cheaper to cash it at a store like Kroger if you don’t have a bank account. Otherwise, you could pay stiff fees at a check cashing place, up to $3 per every $100 in addition to a flat fee. However, it does not hurt to compare prices at other cash checking retailers. Highly consider opening up a bank account at a local bank or credit union to avoid fees. By doing so, you will be able to cash your checks for free. Kroger isn’t the only grocery store in town that will cash your check. Other chains, such as Albertsons, Dillons, Food Lion, Fred Meyer, Giant Eagle, Hy-Vee, King Scooper, Publix, Ralph’s, Safeway, Walmart and more, can cash checks as well. If you budget your money correctly, you might not need your money the same day you receive your paycheck. If you do this, you could deposit your check in your bank and wait a couple of days to withdraw the money if you need it. This could save you at least $6 per month if you receive a payment every two weeks. That may not seem like much, but that equals $72 per year.